Published: July 20, 2014 at 06:10 p.m. 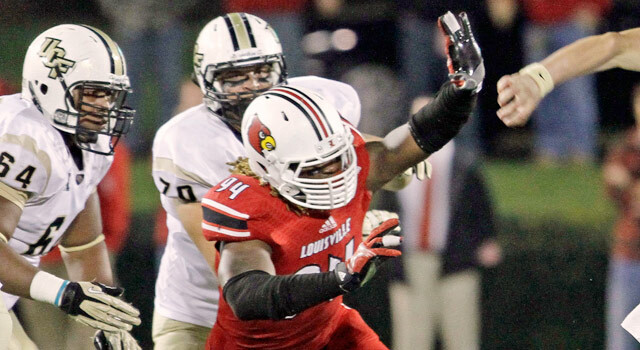 Updated: July 21, 2014 at 09:53 a.m.
Lorenzo Mauldin's position switch could make him more valuable in the eyes of NFL scouts. GREENSBORO, N.C. -- Louisville had one of the most productive defensive end duos in the nation last season, with Lorenzo Mauldin and Marcus Smith combining for 24 sacks and 30.5 tackles for loss. Both will be playing outside linebacker this season -- Smith with the Philadelphia Eagles and Mauldin as a senior with Louisville, which has a new coaching staff and a new defensive scheme. 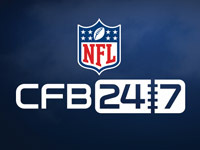 Check out the top 10 players from Louisville to play in the NFL. Smith, who was a first-round pick by the Philadelphia Eagles, had 14.5 sacks last season, which was second-most in the nation to Trent Murphy's 15. Mauldin had 9.5 sacks. Louisville is changing to a 3-4 base defensive set under new defensive coordinator Todd Grantham, who was hired away from Georgia by new coach Bobby Petrino. Like his predecessor, Vance Bedford (now the coordinator at Texas), Grantham likes an aggressive approach. He just does it out of the 3-4, which means a position change for Mauldin (6-foot-4, 244 pounds), a free-spirited senior. While Mauldin is all business on the field, he is anything but off the field. He is known for his dreadlocks, and he changes hair color frequently. He showed up at the ACC Kickoff media event with his dreads colored red and black -- Louisville's team colors -- but perhaps his best-known look was when he sported blond 'locks. He said he likes the position change. One reason is that "it helps me with the NFL scouts" because it shows off his versatility. 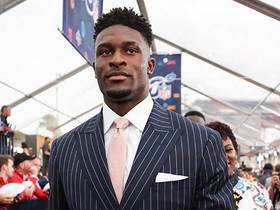 "All of us have aspirations about playing in the league ... and making big money," he said. While college defenses can succeed with 244-pound defensive ends, NFL defenses can't, so Mauldin's position change has the potential to make him more valuable to NFL scouts. 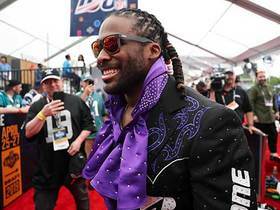 He said his ability to be disruptive off the edge is an "all-natural gift" but admitted the move to outside linebacker has caused him to delve even further into the defensive playbook. He said he had to learn "what plays I need to drop and what plays do I need to rush." Mauldin said Grantham has had his defenders watch film from when he was at Georgia, and Mauldin said he will be playing "the Jarvis Jones position." Jones led the nation with 14.5 sacks in 2012 and had 13.5 in 2011, so that's a lot for Mauldin to live up to. Mauldin said he frequently talks with Smith, a fellow Georgia native -- just like Jones. Mauldin said their talks have focused a lot on the fact that both are changing positions. "He's talked to me about what I need to do, what I need to learn, what the scouts are looking for," Mauldin said. Smith was somewhat of a surprise first-round pick. No one ever questioned his athleticism, but there was some doubt among scouts whether Smith, a 251-pounder, could make the move from end to linebacker. Mauldin isn't quite the athlete Smith is, but moving to outside linebacker this season could end up being an advantage when the 2015 draft rolls around.